OK, first of all, let's talk some facts, shall we? 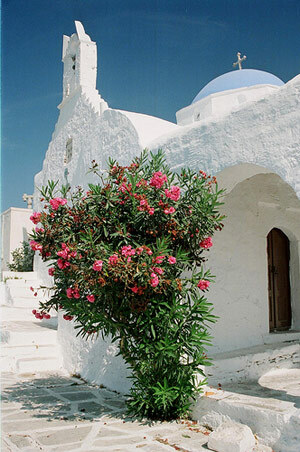 So, Paros is an island of the Cyclades complex, located in the middle of it, west of Naxos. It's big, it's dry, it has three major centers (Paroikia, Naousa and Lefkes), it has meltemia that ease the heat in the summer, it's one of the most popular destinations in Greece and the third most popular island of the Cyclades and, oh my God, all these must sound so boring. Well, anyway, I'm not trying to impress you (it's not like I gain something if you go there), all these are true. Read them slowly and you'll understand why it's important for me to tell them to you. 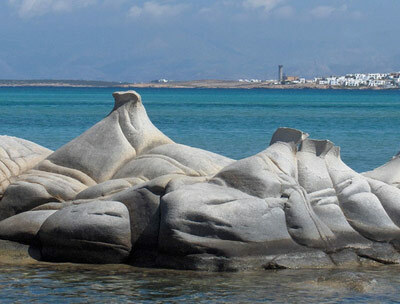 Oh, by the way, Paros is also famous for its marble. OK, OK, I'll stop and get to the point already. So. what's the point? Oh, yeah, well, the point is Paros is great, I guess. 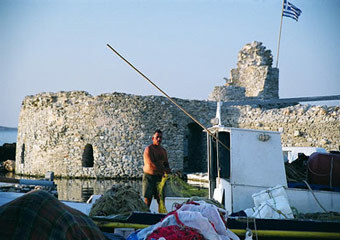 I went to Paros about eighteen years ago. My aunt and uncle have a house in Paroikia and suggested my friends and I could stay there, so everyone agreed that would be our destination. We'd all heard a lot about Paros (some of it from my aunt, since it's her hometown) and we were curious to see what the fuss is all about. So, let me tell you what the fuss is all about. Most guidebooks use a bunch of words one after the other that overflows your head with visuals without really describing. Of course it's not that they're trying to trick you, as your visuals will most probably be 70-80% close to what the island actually is. It's just that there is no other way of telling you what Paros is. The pictures will tell you everything. 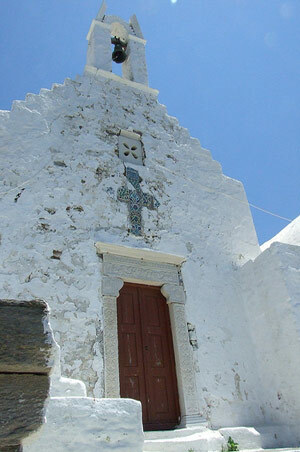 So, all I can tell you is that Paros has a lot of snow-white little houses, small churches and chapels (like Agios Konstantinos and Eleni), narrow alleys, peaceful mountain villages and beautiful, clean beaches. What does that tell you? Nothing, perhaps. You have to see for yourself to fully appreciate Paros, like any other place for that matter. 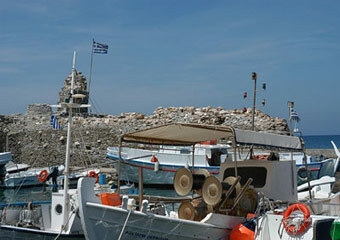 When you arrive to Paroikia, the island's capital, you might feel betrayed by what you see. Well, I didn't because I've gotten used to the characteristics of the Greek islands and didn't care if they were obvious from the first moment or not, but you might. At that point, just remember that appearances are deceptive; whoever said that, they were brilliant. The harbor of Paroikia is a bit touristy you see, with cafιs, bars and tavernas all lined up, but once you get past it, you find out that this resort might be famous, but it's retained its Cycladic beauty in its architecture and style. Before me and my friends left from Athens to get there, we were told (if only I could remember by whom) that Paroikia would greet us with its old, now empty windmill, while Naousa would say 'hello' with the ruins of the Venetian castle near the harbor and the colorful caiques. Now that I think about it, yeah, whoever said that was probably right, not because they are the first things we noticed, but because once we did, we remembered what we were told and said "we're here". OK, that doesn't really make sense, but I hope you can get what I mean. But, even if you don't, please bear with me. 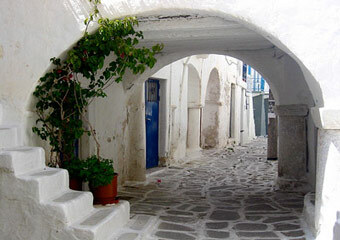 If you search for accommodation in Paros I recommend you to visit Paros Hotel Online Bookings. There, you can make your reservations directly to the hotels and find rooms in low prices and useful guest reviews. I usually separate the interesting places from the historical sites and that's what I'm going to do now too. You see, the line between them may be kind of blurry but some of you may not be interested in visiting historical sites so I have to do my best. For example, the Church of the Ekatontapyliani (or Katapoliani - note that it's a totally different word, not an abbreviation) can be placed in both categories, since it's a church but also a Byzantine monument. 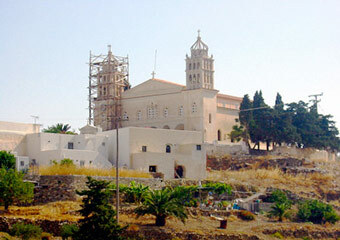 Anyway, its name means "Our Lady of a Hundred Doors" (or Our Lady towards the Lower Town" respectively), because it supposedly has 100 openings. Of these only 99 are said to have been identified till now and legend holds that when the 100th door is found, the Greeks will own Constantinople (Istanbul) again. The archaeological museum could be placed in both categories too. 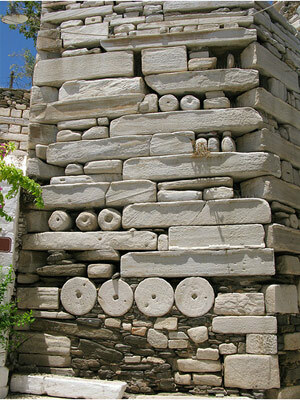 Well, it's obviously not a historical site, but its content is of historical value: Neolithic finds and exhibits that date from the Proto-Cycladic civilization of 6000 BC that were found at the excavations on Sialangos Island. It's a must is all I can tell you. Or at least I enjoyed 'exploring' it. Now Antiparos is clearly a category-A place. Before saying anything, just let me warn you: dare not imply that Antiparos is just a part of Paros in front of the locals, or it'll be your skin that's on the line. Other than this tiny detail, its people are quite complaisant though. 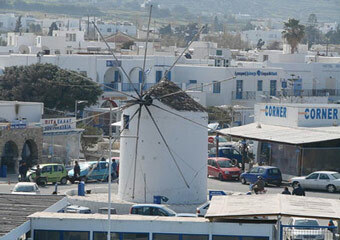 Antiparos was once joined to Paros by a causeway and can be reached quite easily. It's mostly a small, quiet island, but its nightlife is surprisingly humming. What makes Antiparos so special is its famous cave, the Cave of Antiparos, or Spilio Stalactiton ('the Cave of the Stalactites') as it is alternatively known. 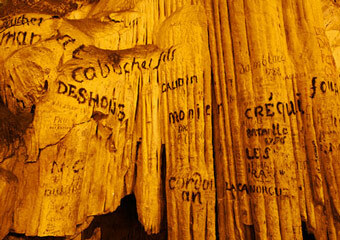 The stalagmites and stalactites are only half of it: famous visitors of the past like Lord Byron and King Otho of Greece have smoked and carved their names on the walls to make up for breaking of some of the stalactites. 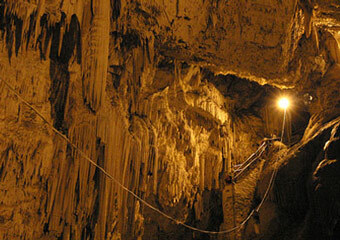 But, whatever, the point is the cave is ravishing, 160 meters underground, 216 m long and 18 m high. Have you heard of Psychopiana? Hah, me neither. 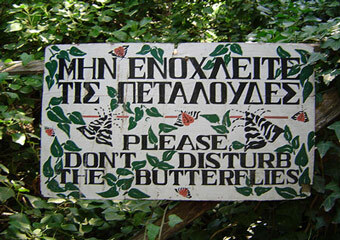 It wasn't till recently that I heard the Valley of Butterflies ('Petaloudes') in Paros was also called that. I don't even know what it means! Anyway, the valley is 6km south of Paroikia and it's the place where tiger moths set up housekeeping in July and August. 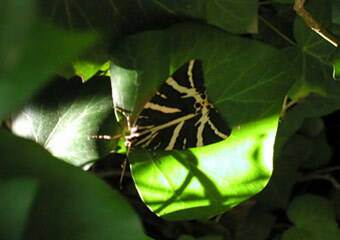 You should definitely visit it, it's gorgeous and watching the moths is amazing. 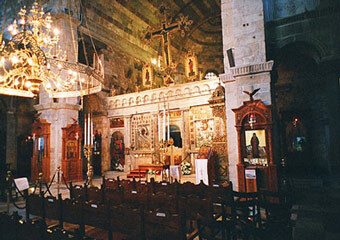 There's also a couple of churches and monasteries (besides Katapoliani) that you could visit. 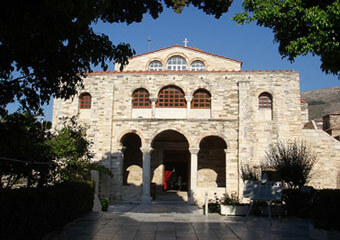 Agios Ioannis Theologos and Kimissi tis Theotokou in Naousa, the Marble Church of Agia Triada in Lefkes or Moni tou Christou tou Dasous ('Christ's Forest Monastery') that is dedicated to the Transfiguration of Our Savior and where entering is only allowed for women. There's also the Longovardos Monastery which is a collection of buildings in the shape of a cross where only men are admitted, but visitors are kind of. discouraged. Don't stress though, if you really want to visit it, no one is going to ban you. They're not quite many unfortunately, but at least they're impressive. 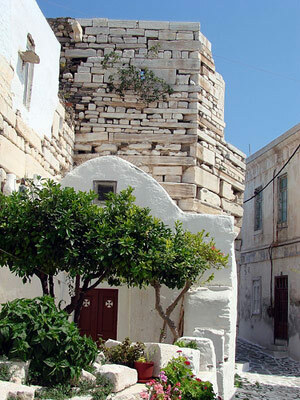 Like the Kastro, built in the 13th century by the Venetians, where you will find ruins of the Venetian temple of Christ. Or the ruins from the sanctuaries of Aphrodite, Zeus and Eileithyia that you will find on the top of Profitis Ilias which also happens to be Paros' highest peak. In Paroikia you will find two important historical sites, the ancient cemetery that was excavated in 1983 and dates from the 7th century BC, full of Roman graves, and the Frankish Kastro that was built on the remains of Athena's temple by Marco Sanudo in 1260. In Naousa, on the other hand, you will only find the Byzantine and the folklore museum, but they're worth your time, so pay them a visit if you like. Are there any good beaches in Paros? I personally love swimming, but I usually like organized beaches with sand that deepen normally (if you get what I mean), even if the waters are not the clearest possible - which is why I enjoy pools more. But going to a Greek island and not visiting the beaches is like going to the source and not drinking water, as a Greek expression says. Kolymbithres. A series of little beaches protected from the wind, I only visited it once because of lack of time, but I totally loved it. It's usually crowded, but you should swim there at least once. Monastiri is a sandy beach with turquoise waters that's also sheltered from the wind. Langeri is a bit crowded, but the smaller beach on the northeast tip of it is a bit more secluded. It has no canteen so you should go prepared. Farangas is peaceful and small, with crystal-clear waters. Santa Maria is divided into two. It's almost always crowded, but at least it's large enough to not matter. Pounta is a lovely beach that mostly attracts the young crowd due to its quite popular beach bar, actually one of the biggest in Cyclades. Kalogeros, narrow and decent, is ideal if you have children since it's near Molos beach that has shallow waters. Nea Chryssi Akti is a paradise for windsurfers and if you don't mind them it's a quite beautiful beach. Finally, Parasporos is most likely the best beach in Paroikia. It's sandy and organized, my kind of thing. Well, how does the Mad Rooster sound like? Mad, huh? It's in Paroikia and it's quite cheap (less than 12 euros). It specializes in pancakes. Magaya on Delfini Beach is another cheap option with excellent seafood macaroni. 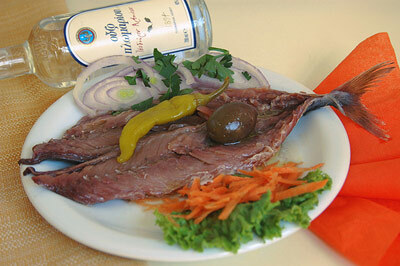 Barbarossa is a taverna in Naousa that serves excellent fish and mussel soups. Apollon in Paroikia may be a little pricy (scratch the 'may', it is), but the setting is great and the dishes like soutzoukakia and grilled chicken are all worth it. Christos in Naousa is a little expensive as well, but it has excellent classic Mediterranean cuisine and a pleasant environment. 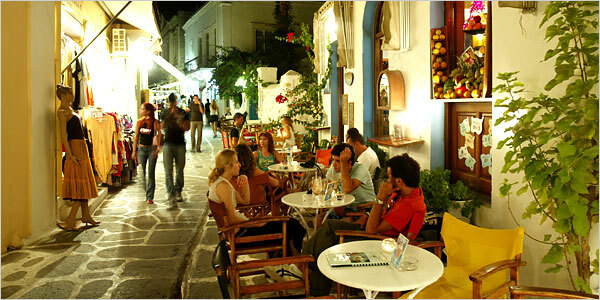 Paros is quite known for the young crowd it attracts. As you would expect, the island's nightlife has adjusted to this fact, offering a lot of options that will appeal to this crowd. Thankfully, Paros is not inconsiderate! Even if you're not in your early twenties, you will surely find a place to have some fun! Let's start with those of you who are in your early twenties, though. Places like Rex, Black Barts and Salon d'Or on the strip of Paroikia are ideal for a cocktail at night. The Paros Rock Complexs is a quite appealing idea as well, with four disco bars, including the famous Dubliner. Cafι del Mar on Naousa's waterfront and The Golden Garden at Chryssi Akti are two of the most popular choices though. Now, your other choices are not limited! Cine Paros is Paroikia's outdoor cinema. Pirate's is a beautiful place with jazz music, Pebbles and Evinos play a bit more classical music and Varrelathiko Greek music. Now, one last and rather important question: how will you get there? 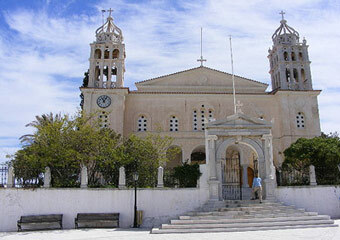 Paros has an airport in Paroikia and there are 2-7 flights daily in season from Athens. Well, the airport is actually 14kms away from Paroikia, but there is frequent bus service to and from it. By sea, Paros is perhaps the center of the Aegean, with many daily ferry, hydrofoil and catamaran connections with Piraeus, Tinos, Mykonos, Rafina, Naxos, Santorini, Ios and Syros; 3 times per week with Thessaloniki, Anafi, Sikinos and Folegandros; several times per week with Rhodes, Astypalaia, Samos, Kalymnos and Kos; 2 times per week with Crete, Milos, Ikaria, Sifnos, Kimolos and Serifos; once per week with Andros. See the pattern? The point is you can go anywhere or come from anywhere your heart desires. Your options are ceaseless.